The book of Isaiah provides us with the most comprehensive prophetic picture of Jesus Christ in the entire Old Testament. Read more about the book of Isaiah. 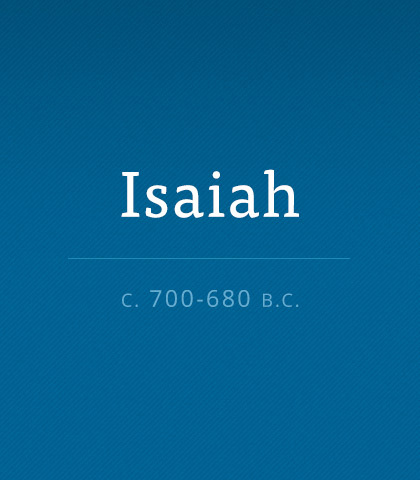 The final decades of the eighth century BC produced several great men, but perhaps the most significant of these was a blue-blooded prophet called Isaiah. That’s quite a statement when you consider his contemporaries were Amos, Hosea, and Micah. God’s Word says that there will be a day of judgement. But as Christians that’s not something that we need to fear. When we placed out trust in Christ our guilt was removed, now and for eternity. When is "Good Enough" Good Enough? In other words, sometimes just getting something done is more important than doing a fantastic job. If you stipulate perfection or nothing, the result will be nothing…every time. In the beauty of God's holiness, we see the ugliness of our wretchedness, yet we also find the encouragement to be holy…as He is. What Every Believer Must Never Forget! "God and God Alone..."
King Uzziah's extraordinary fame and success resulted in pride and arrogance, so much so that the high priest, Azariah, and 80 other priests confronted him, resulting in the Lord’s striking the king with leprosy, a punishment that would follow him to his grave. In the backwash of all this, a young, very-concerned prophet named Isaiah turned to the Lord to gain understanding. What happened to that young prophet leaves us with four truths we must never forget. From the biblical text it didn't seem like Isaiah involved himself in changing the moral or spiritual landscape of his country—at least, not until he faced a heartbreaking loss and then had a life-changing encounter with God. If you aren’t Jewish, then you’re what the Bible calls a “Gentile.” Most folks who follow the Jewish Messiah, Jesus, are just that—Gentiles. And as Gentiles, most of us don’t always understand Jewish Scripture, the Old Testament. This is particularly true when it comes to reading the prophetic books of the Bible. However, it’s helpful to keep in mind that the Old Testament makes the first announcements of Messiah’s coming and ministry. And few prophetic books have more prophecies about Messiah Jesus than the book of Isaiah. God doesn’t rush. Carefully and sovereignly He works to reveal His glory. From the morning sunrise, which slowly spreads its rays across the face of the earth, to the unfolding of His plan in each of our lives, God takes His time to achieve His will. How unlike us! We are impatient, anxious, and impulsive, wondering why things haven’t happened as quickly as we wish.